Commander-in-Chief of the Navy (since September 11, 2007). Admiral. Born on August 18, 1954, in the town of Komarno, Lvov Oblast, the Ukrainian Soviet Socialist Republic. Graduated from the Nakhimov Naval School, the Black Sea Naval Academy (Sevastopol) in 1976, the Supreme Special Courses for Navy Officers in 1982, the Naval Academy (with a gold medal) in 1990, and the General Staff Academy (with a gold medal) in 1999. His service began in the Pacific Fleet: CO of antisubmarine group of the mine and torpedo department of a major antisubmarine ship, CO of the mine and torpedo department, assistant CO of the cruiser Admiral Senyavin. From 1983, he was senior assistant CO of a missile cruiser, from 1986, senior assistant CO of the aircraft carrier Minsk. In 1990, he was appointed crew CO of the aircraft carrier Varyag under construction, however, the construction was suspended and the ship was sold to China to be disassembled into metal parts. In 1992, he was appointed deputy CO, and in 1994, CO of the 36th missile ship division of the Pacific Fleet. In 1999, he was transferred to the Northern Fleet as chief of staff of the Kolsk Flotilla of Diverse Forces (in 1993-1996, the post was held by his predecessor at the Commander-in-Chief of the Navy post, Vladimir Masorin). In 2000, he took part in the rescue operation for the K-141 Kursk submarine. On January 21, 2002, he became CO of the Kolsk Flotilla of Diverse Forces. On August 20, 2004, he was appointed chief of staff of the Baltic Fleet. From September 26, 2005, he was CO of the Northern Fleet. Born on November 23, 1947, at the Czharomte [transliterated] station in the People's Republic of China. In 1968, he graduated from the Far Eastern Nautical College and was summoned for active duty in the Navy. In 1976, he graduated, externally, from the navigation officer department of the Makarov Pacific Fleet Higher Naval College, in 1979, from the Naval Academy, in 2001, from the Military Academy of the General Staff. From 1968 to 1985, he served on surface ships of the Pacific Fleet, where he went through all the ranks from CO of a combat unit to a large unit CO. From 1985, he was doing staff work. In 1993 he was appointed CO of a large unit of diverse forces. From 1997, he was the Pacific Fleet chief of staff. On December 3, 2001, by the executive Order of the President of the Russian Federation, he was appointed CO of the Pacific Fleet, decorated with the Order of the Red Banner. On September 23, 2002, by the executive Order of the President of the Russian Federation, he was awarded the military rank of Admiral. He had been awarded with the Order for Service to the Homeland in the Armed Forces of the 3rd Degree, the Order of the Red Star, and the Order of Military Merit. Born on August 16, 1955, in Bryansk Oblast. In 1978, having graduated the Kaliningrad Highest Naval School, he started his officer duty as the ship’s assistant CO, CO of the navigation department of the coastal minesweeper Altaysky Komsomolets of the Tallinn Naval Base, then appointed CO of the coastal minesweeper Komsomolets Estonii. From 1983 to 1998 he held positions of chief of staff and CO of the minesweeper division of the Baltiysk Naval Base, chief of staff and CO of a large unit of the waterways defense ships, and chief of staff and first deputy CO of a large unit of the Leningrad Naval Base’s ships, consecutively. In 1989, he graduated from the Kuznetsov Naval Academy. From 1998 to 2001, he was the Baltic Naval Base chief of staff. From 2001 to 2003, he was cadet of the General Staff Academy of the Armed Forces of Russia. After having graduated, Aleksandr Dmitrievich was appointed to the Baltic Fleet, first as CO of the Baltic Naval Base, then as the Baltic Fleet chief of staff. Vice Admiral Aleksandr Kletskov had been awarded the Order of Military Merit and many other medals, including the Medal for Combat Merits. Vice Admiral Kletskov was appointed CO of the Black Sea Fleet by the executive Order No. 917 of the President of the Russian Federation, dated July 17, 2007, and by the corresponding Order No. 834 of the Minister of Defense, dated July 18, 2007. Commander-in-Chief of the Baltic Fleet (since December 6, 2007). Vice Admiral. Born on March 18, 1958, in Bryansk. Graduated from the Black Sea Highest Naval School (Sevastopol) in 1980, the Supreme Special Courses for Navy Officers in 1986, the Naval Academy in 1991, and the General Staff Academy in 2000. In the Baltic Fleet he served as CO of the air defense missile battery, CO of the missile and artillery department of the small missile ship Grad, and assistant CO of the small missile ship Molniya. From 1986, senior assistant CO of the large missile ship Prozorlivy. In 1988, he became CO of the destroyer Speshny, which had just been taken out of conservation. It entered service in the fleet in 1955 and was eventually decommissioned in 1989. In 1991, he was CO of a small missile ship division, missile ship brigade chief of staff, and CO of a missile boat brigade of the Baltic Fleet. In 1996, he was appointed chief of staff of the Baltic Naval Base (its CO was Aleksandr Tatarinov, now the Navy’s first deputy Commander-in-Chief). 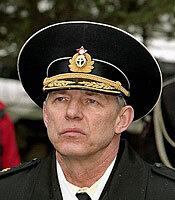 From July 2000, Viktor Mardusin served as deputy chief of staff of the Baltic Fleet, from May 2001, as CO of the Baltic Naval Base. From August 2003, he was deputy CO of the Pacific Fleet. In March of 2005, he was appointed first deputy CO of the Black Sea Fleet (and once again served under the leadership of Aleksandr Tatarinov). From May 2006, he is the Pacific Fleet’s chief of staff. Rear Admiral Kravchuk Viktor Petrovich was born on January 18, 1961, in Palasher town, Bereznikovsky District of Perm Oblast. In 1983, he graduated from the Highest Naval School in the city of Vladivostok, in 1997, the Naval Academy (externally). He served in the Pacific Fleet as CO of a navigation department, assistant CO, and CO of a missile boat. After graduating from the Supreme Special Courses for Navy Officers in 1988, he continued serving as CO of a missile boat, CO of a missile boat division, chief of staff, and CO of a missile boat brigade. 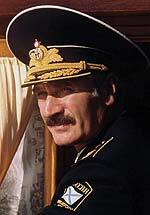 In 1999-2000, he was flotilla deputy CO and head of armament and weaponry operation service of the Caspian Flotilla. In 2002, he graduated from the General Staff Academy of the Armed Forces. 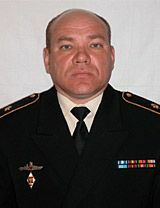 In 2002-2003, he was deputy CO of the Caspian Flotilla. 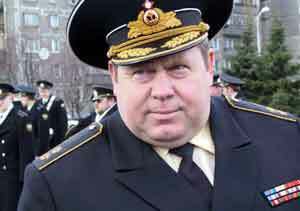 In 2003-2005, he was chief of staff and first deputy CO of the Caspian Flotilla. In 2004, by executive Order of the President of the Russian Federation, he was awarded the military rank of Rear Admiral. In 2005, by executive Order of the President of the Russian Federation, he was appointed CO of the Caspian Flotilla. Born on July 16, 1947, in the city of Krasnyy Luch of Lugansk Oblast. In 1969, he graduated from the Leninsky Komsomol Highest Naval School for Submarine Navigation. He also graduated from the Supreme Special Courses for Officers (1974), the Naval Academy (1983), and the General Staff Academy of the Armed Forces of the Russian Federation (1993). He began service as CO of the control group of the missile and artillery department of Project 644 C-44 submarine. He was then CO of the mine and torpedo and the missile and artillery departments on this submarine. In 1971, he was appointed assistant CO of the Project 651 K-70 submarine. Having graduated from the Supreme Special Courses for Officers, he served as senior assistant CO of a cruiser submarine, and in 1978 became CO of the Project 670 K-325 submarine, which had crossed from the North to the Pacific Fleet. Having graduated from the Naval Academy in 1983, Vladimir Prokofyevich served in the Pacific Fleet as deputy, and, from 1988, as CO of a submarine division. In 1991-1993, he was cadet of the General Staff Academy of the Armed Forces of Russia. Afterwards, he was appointed chief of staff and first deputy CO of the 4th Submarine Flotilla in Primorye. 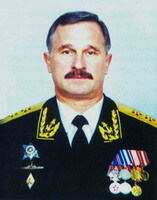 After the Flotilla was reorganized into a Squadron, Rear Admiral Valuyev became its first CO. From 1996, Vice Admiral Valuyev was deputy chief of the Main Staff of the Navy. By the executive Order of the Minister of Defense, dated 11.20.1996, he was appointed first deputy CO of the Baltic Fleet, replacing Vice Admiral V.A.Popov. After Admiral V.G.Egorov was elected Governor of the Kaliningrad Oblast in November of 2000, Vladimir Prokofyevich functioned as CO. By executive Order No. 415 of the President of Russia V.V.Putin, dated April 11, 2001, Vice Admiral Vladimir Valuyev was appointed CO of the Baltic Fleet. By executive order of the President of the Russian Federation V. Putin, dated December 11, 2001, CO of the Baltic Fleet Valuyev was awarded the next higher military rank of Admiral. Vladimir Prokofyevich had been awarded with three Orders, including the Order of Courage. He is married and has two daughters. Born on November 26, 1938, in Moscow, to a blue-collar family, he began his working carrier in 1955 at one of Leningrad’s enterprises. He joined the Frunze Higher Naval School and graduated with honors in 1962. He also graduated from the Supreme Special Courses for Officers (1971), the Naval Academy (1984), and the Military Academy of the General Staff (1990). He served his officer’s duty in the Northern, the Black Sea, and the Baltic Fleets. He went through all the ranks starting with the CO of a mine and torpedo department to CO of the Project 61 major antisubmarine ship Obraztsovy. From November 1962, he was in command of the artillery and the mine and torpedo departments of an antisubmarine ship, belonging to the antisubmarine ship division of the Northern Fleet. From 1965, he was CO of the mine and torpedo department of the patrol ship Slavny of the missile ship brigade of the Baltic Fleet. From September 1967, he was senior assistant CO of the major antisubmarine ship Obraztsovy, from August 1971 – senior assistant CO of the major antisubmarine ship Bditelny, and from November 1971 – CO of the major antisubmarine ship Obraztsovy of the missile ship brigade of the missile ship division of the Baltic Fleet. In June of 1974, he was appointed chief of staff and deputy CO of a destroyer brigade of the missile ship division of the Baltic Fleet, and in October 1983 – CO of an independent missile boat brigade of the Baltic Fleet in Swinoujscie (Poland). In September of 1985, he was appointed CO of the Baltic Naval Base and from December of 1986 to December of 1988, he was in charge of the Mediterranean Flotilla of the Black Sea Fleet. In December of 1988, he was appointed first deputy CO of the Baltic Fleet, and from December 13, 1991 - CO of the oldest Fleet in Russia – the Baltic Fleet. In November of 2000, he won the elections for Governor of the Kalinigrad Oblast. Over the time spent in the sea, he had traveled 147,624 nautical miles and participated in Okean maneuvers and in seventeen military service campaigns. Rear Admiral, on November 5, 1985. Vice Admiral, on February 15, 1989. Admiral, on October 24, 1991. Order of Services to the Fatherland of the 3rd Degree. Order for Service to the Homeland in the Armed Forces of the 2nd Degree. Order of Military Training (the Syrian Arab Republic). Honorary Member of the Royal Swedish Society of Naval Sciences. Honorary Member of the Military Attache Association. Candidate of Military Science specializing in control and command of the forces. He is married and has two children, a son and a daughter. His son is a Navy Officer. He has four grandchildren. Born on August 14, 1950, in the city of Nikopol of Dnepropetrovsk Oblast, to a blue-collar family. Ukrainian. In 1972, he graduated from the Frunze Higher Naval School of Leningrad. He also graduated from the Supreme Special Courses for Officers (1977), the Naval Academy (1985, with honors), and the Military Academy of the General Staff (1992). He began service in Baltiysk as CO of the mine and torpedo and the missile and artillery departments of the Project 204 small antisubmarine MPK-85 ship, belonging to the brigade of ships of the waterways defense. In a year he became assistant CO, and in 1974 he was appointed CO of the ship. Having graduated from the Supreme Special Courses for Officers of the Navy, he became CO of a small antisubmarine ship, from 1979, he was chief of staff, from 1981 – CO of an antisubmarine ship division of the Baltic Naval Base. From 1985, he was chief of staff and deputy CO of an antisubmarine ship brigade, and CO of a brigade of ships of the waterways defense of the Baltic Fleet. In 1987-1990, he held the post of chief of staff and deputy CO of the Baltic Naval Base, and CO of an antisubmarine ship division of the Baltic Fleet. In 1990-1992, he was cadet of the General Staff Academy of the Armed Forces of Russia; having graduated, he was appointed as CO of the Baltic Squadron of Diverse Forces. In 1993, Vladimir Petrovich became CO of the Baltic Naval Base. 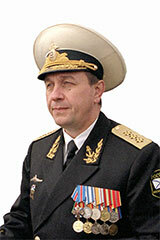 From April of 1996, Vice Admiral Komoyedov was chief of staff of the Baltic Fleet. In August of 1997, he was appointed to the Northern Fleet where he held the post of the first deputy Commander-in-Chief of the Fleet. 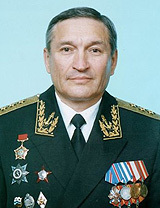 In July 1998, by executive Order of the President of the RF, Vice Admiral Komoyedov Vladimir Petrovich was appointed Commander-in-Chief of the Black Sea Fleet of the RF, awarded the military rank of Admiral. By executive Order of the President of the RF, dated 10.09.2002, he was relieved of the post of the Commander-in-Chief of the Black Sea Fleet. He had been awarded the Order of Services to the Fatherland of the 4th Degree, the Order of Military Merits, and the Order for Service to the Homeland in the Armed Forces of the 3rd Degree, and medals. The Ukrainian President awarded the Admiral with the Order of Bogdan Khmelnitskiy. He is married and has a daughter. Born on August 24, 1947, in the town of Popovka, Kalininsk (presently Tver) Oblast. Russian. In 1970, he graduated from the Nakhimov Black Sea Highest Naval School. He also graduated from the Supreme Special Courses for Officers (1977), the Naval Academy (externally, 1986), and the Military General Staff Academy (1993). Having graduated the Academy, he was assigned to the Northern Fleet. He served as CO of the control group of a major antisubmarine ship’s missile and artillery department, CO of a major antisubmarine ship’s missile and artillery department, and, from 1977, as senior assistant CO of a large missile ship. In November of 1980, Captain of the 3rd Rank Masorin was appointed CO of the Project 956 destroyer Otchayanny, which was in construction. The ship successfully passed testing and joined the 56th brigade of destroyers of the Northern Fleet. He had also been in charge of a major antisubmarine ship. He was awarded the military rank of Captain of the 2nd Rank ahead of schedule. In 1983, he was appointed chief of staff and deputy CO of a brigade of destroyers of the Northern Fleet. A year after his graduation from the Naval Academy, Vladimir Vasilyevich becomes CO of a brigade of destroyers of the Northern Fleet, and in January of 1989 – chief of staff and deputy CO of the 7th operative squadron of the Northern Fleet. Having graduated the General Staff Academy of the Armed Forces of the RF, he continued service in the Northern Fleet as chief of staff and first deputy CO of a flotilla. 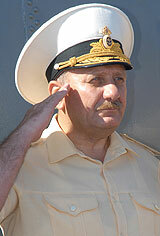 In 1996, Vladimir Vasilyevich Masorin was appointed CO of the Caspian Flotilla of the Navy of the RF. By executive Order of the President of the Russian Federation, dated October 9, 2002, Vice Admiral Masorin was appointed Commander-in-Chief of the Black Sea Fleet of the RF. He replaced Admiral Komoyedov, Vladimir Petrovich, in this post. His awards include the Red Banner of Labor, the Order for Service to the Homeland in the Armed Forces of the 3rd Degree, and medals. He is married and has two sons. Born on February 24, 1954, in the city of Odessa. In 1976, he graduated from the Frunze Higher Naval School of Leningrad. He also graduated from the Grechko Naval Academy (1987) and the Military General Staff Academy of the Armed Forces of the RF (1996). Vladimir Ivanovich’s entire service career passed in the Northern Fleet. After graduating from the Academy, he was appointed CO of the mine and torpedo department of the Project 57A major antisubmarine ship Zorkiy. In 1980, he became senior assistant CO of the Project 57A Guard major antisubmarine ship Gremyashchy. Three years later (in March of 1983), he was appointed CO of this ship. Having graduated from the Naval Academy in 1987, Vladimir Ivanovich served as the senior assistant CO of the heavy nuclear missile cruiser Kirov, and, from 1989 to 1991, he was in charge of the cruiser. At the end of 1991, Captain of the 1st Rank Rogatin was appointed first chief of staff of the 43rd missile ship division, at that point formed as part of the 7th operative squadron of the Northern Fleet. In 1994-1996, he was cadet of the General Staff Academy of the Armed Forces of Russia, followed by appointment to CO of the 43rd division of missile ships. By executive Order No.463 of the President of the RF, dated 05.09.1997, Rogatin, Vladimir Ivanovich, was awarded the rank of Rear Admiral. From September of 1998, he served as chief of staff and deputy CO of the 7th operative squadron of the Northern Fleet. 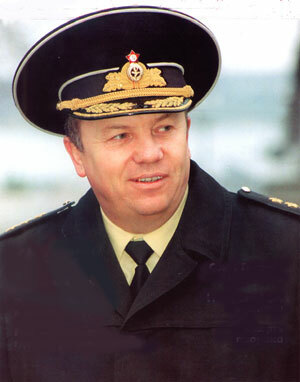 At the end of October 2001, Rear Admiral V. I. Rogatin was appointed CO of the Novorossiysk Naval Base. Vladimir Ivanovich had been awarded the Order for Service to the Homeland in the Armed Forces of the USSR of the 3rd Degree (1990), the Order of Military Merits (1995), and the Order of Courage (2001). Photo by: the Almanac Taifun. Born on January 7, 1947, in the town of Mitropolye of the Sechenovsky District, Gorkov (presently Nizhny Novgorod) Oblast. Russian. In the Armed Forces since April 8, 1964. In 1969, he graduated from the Frunze Higher Naval School, in 1978, the Supreme Special Courses for Officers, and in 1983, the Naval Academy. In 1969 -1970, he served as CO of the mine and torpedo group of a large submarine of the Northern Fleet, in Polyarnoe. From 1970 to 1972, he held position of CO of the mine and torpedo department on a submarine, he was then assistant CO and senior assistant CO of the submarine. Having graduated from the Supreme Special Courses for Officers of the Navy, in July of 1978, he was appointed CO of a Northern Fleet submarine. In October of 1985, he was appointed chief of staff and deputy CO of the 42nd brigade of submarines of the Northern Fleet. In 1985-1988, he held the post of CO of the 42nd brigade, and, from November 1988 to February 1992, he served as chief of staff and deputy CO of the 4th submarine squadron of the Northern Fleet, decorated with the Order of the Red Banner and the Order of Ushakov of the 1st Degree. In 1992, he was appointed CO of the squadron. By the executive Order of the President of the Russian Federation, dated December 29, 1994, Gennady Aleksandrovich Suchkov was appointed first deputy Commander-in-Chief of the Black Sea Fleet of Russia. By the executive Order No.880 of the President of the RF V. V. Putin, dated July 19, 2001 (Order No.623 of the Ministry of Defense, dated 07.25.2001), Vice Admiral Suchkov was appointed Commander-in-Chief of the Pacific Fleet. By the executive Order of the President of the Russian Federation, dated December 4, 2001, Gennady Aleksandrovich was appointed Commander-in-Chief of the Northern Fleet of Russia. Gennady Aleksandrovich had been awarded the Order of the Red Star, the Order for Service to the Homeland in the Armed Forces of the USSR of the 3rd Degree, and many medals. He is married, has two children. His son, Aleksandr, is an officer submariner, Captain of the 3rd Rank, and serves in the Northern Fleet. The Black Sea Fleet’s and the Pacific Fleet’s press service information was used, as well as that of the national informational service Strana.Ru and other sources. Photo from the informational site of the Black Sea Fleet of the RF. Northern Fleet Commander-in-Chief (since November 19, 2007). Vice Admiral. Born on May 15, 1956, in the city of Bolgrad, Odessa Oblast, Ukrainian Soviet Socialist Republic. In 1973, he graduated from the Leningrad Nakhimov Naval School, in 1978, the Leninsky Komsomol Highest Naval School for Submarine Navigation (Leningrad), in 1986, the Supreme Special Courses for Navy Officers, in 1995, the Naval Academy, and in 2000, and the General Staff Academy (with a gold medal). He served on Northern Fleet submarines as group CO, CO of the missile and artillery department, assistant CO, and senior assistant CO of a submarine cruiser. He was then in charge of the nuclear ballistic missile submarine K-137 Leninets (Project 667A head submarine) and was deputy CO of a submarine division. From April 1996, he was CO of the 31st submarine division (it includes strategic-purpose submarine missile-carriers). In 2000-2001, he was deputy CO of the 7th Atlantic operative squadron of surface ships of the Northern Fleet. From 2001, he was chief of staff of the 3rd submarine flotilla. After the flotillas have been transformed into squadrons in September of 2002, Nikolai Maksimov was in charge of the 12th submarine squadron of the Northern Fleet. From 2005, he was deputy CO of the Northern Fleet (he worked under the leadership of Vladimir Vysotsky, now Commander-in-Chief of the Navy). Chief of Main Staff of the Navy (since September 4, 2005). Admiral. Born on July 6, 1956, in Vladivostok, to a family of military men. In 1978, he graduated from the Pacific Highest Naval School (Vladivostok) as engineer/electro-mechanic, in 1984, the Supreme Special Courses for Navy Officers, in 1989, the Naval Academy, and in 2001, the General Staff Academy. He began his service in the Pacific Fleet as CO of the start battery of the mine and torpedo department of the patrol ship Storozhevoy (the ship where in 1975 Captain of the 3rd Rank Valery Sablin raised mutiny, after which the ship was transferred from the Baltic to the Pacific Fleet). He was then the senior assistant CO and later the CO of a patrol ship. From 1989, he was the chief of staff of a brigade of assault landing ships of the Baltic Fleet. In March of 1990, he returned to the Pacific Fleet, where he held the posts of deputy CO of a brigade, chief of staff, CO of a surface ship division, chief of staff of the Kamchatka Flotilla, and chief of staff of the Russian Federation’s northeast grouping of troops and forces. In 1992, during the war in Iraq, he was in charge of the Russian fleet’s detachment in the Persian Gulf. 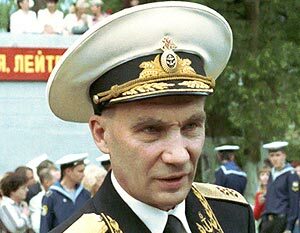 From 2001, he was CO of the Primorsk Flotilla of the Pacific Fleet. 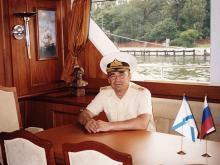 On July 21, 2003, he was appointed chief of staff of the Baltic Fleet. From May 28, 2004, he was CO of the Northern Fleet. First Deputy Commander-in-Chief of the Navy (since July 17, 2007). Admiral. Born on October 25, 1950, in Olovianinsky District, Chita Oblast. Graduated from the Black Sea Highest Naval School in 1972, the Supreme Special Courses for Navy Officers in 1980, the Naval Academy in 1988, and the General Staff Academy (externally) in 2002. He served in the Baltic Fleet as engineer and as head of laboratory of the mine-torpedo weapons and equipment base. From 1973, he was battery CO, from 1976, CO of missile and artillery department of the major antisubmarine ship Slavny. From 1977, senior assistant CO on the patrol ships Bodry and Neukrotimy. From 1980, CO of the major antisubmarine ship Obraztsovy (the ship was in capital repair from 1977 to 1984). From 1988, he was chief of staff, from 1990, CO of the 26th antisubmarine ship brigade of the Baltic Fleet. In 1994, he was appointed chief of staff of the Baltic Naval Base. From April 1996, he was CO of the base. From September 1997, he was chief of staff of the Black Sea Fleet, from February 15, 2005, Commander-in-Chief of the Black Sea Fleet. Pacific Fleet Commander-in-Chief (since December 6, 2007). Vice Admiral. Born on February 2, 1953, in Khabarovsk. Graduated from the Pacific Highest Naval School (Vladivostok) in 1975, then the Supreme Special Courses for Navy Officers, the Naval Academy in 1989, and the General Staff Academy in 1994. Served in Kamchatka in the 45th antisubmarine division of nuclear submarines of the Pacific Fleet as CO of the mine and torpedo department, assistant CO, senior assistant CO of a submarine, crew CO, and CO of a submarine. He was then deputy CO, CO of the 45th submarine division of the Pacific Fleet (the large unit included Project 971 nuclear-powered attack submarines). From November 1996, he was chief of staff of the 2nd submarine flotilla (reorganized into the 16th submarine squadron in May of 1998). From August of 1999 he was chief of staff, from June of 2000, CO of Russia’s northeast grouping of troops and forces. From April 2002, he was the Pacific Fleet’s chief of staff. In the fall of 2005, after AC-28 bathyscaphe sank near Kamchatka, Konstantin Sidenko, among other fleet officials, was reprimanded and given a warning about being incompletely qualified for his position. 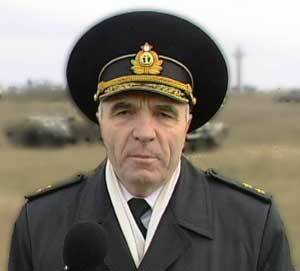 From May of 2006, he was in charge of the Baltic Fleet.